The Indian finance ministry had set up a committee to suggest measures to deal with wilful defaulters. VK Bhasin, former secretary in the law ministry’s legal department, is the advisor to the committee. “Some suggestions include, ‘summary trials,’ in such cases. 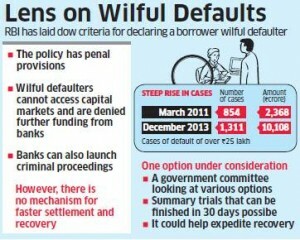 Those accused of wilful default face the prospect of being put on trial within 30 days of a bank determining that a borrower was not paying despite being able to, if a proposal being considered by a committee set up by the government to deal with high value loan defaults finds its way into the statute books. Summary trial is essentially a fast track proceeding where a case is resolved in one or two sittings. However, no sentence of imprisonment for a term exceeding three months can be passed in a summary trial. “These are meant to act as deterrent, and in cases where more action needs to be taken, regular trial procedure can be followed,” said a finance ministry official, adding that the recommendations are still being debated. The number of wilful default cases at state run banks has risen to 1311 at the end of December 2013 from 854 at the end of March 2011. The Reserve Bank of India defines a ‘wilful defaulter’ as a borrower who a) took out a loan and having no intention to paying it back and b) has assets to repay the loan. This is a commendable development and it is hoped it will deter fraudsters, such as willful defaulters.